A couple of years ago, the phrase above came to me as I listened to yet another anti-“chemistry” rant in the media. The phrase struck me as one that would communicate the positive impact that chemical engineers have on their regional, national, and even global societies and economies. I don’t think I’m alone in saying that the process industries haven’t done a very good job of telling the world about the good we do. “Chemical” has become, somewhere along the line, a dirty word. We have probably all had the experience of having to quickly educate someone as to the number of products in their daily lives that would not (indeed, could not) exist without chemistry and the refining/chemical industry. Shoes, clothing, personal care products, makeup, perfumes, automobiles, paper products . . . the list is endless. Take a step further and think about all the advances in materials chemistry that make computing/electronics what they are today. And yet, “chemical engineer” represents something nefarious to many. But it is chemical engineers who will be called upon to design and build new energy sources, new battery technologies, and processes to better clean effluent streams from chemical and power plants. We will be a part of plans to help bring food and fresh water to the planet’s growing population. We will continue to help improve the standard of living across the globe. We will increase the efficiency of today’s chemical processes, and we will help develop tomorrow’s processes. So I considered a campaign to tell the world that you, as chemical engineers, are heroes. Something simple that wouldn’t be about anything other than bringing some positive attention to our education and careers. It isn’t always why we chose chemical engineering to start with, but it is why many of us are dedicated to the profession. It is why, up and down the halls of Chemstations, we’re all members of the American Institute of Chemical Engineers. It is why we support the activities of the AIChE. We’re proud of chemical engineering and we’re proud of you, the world’s chemical engineers. Come see us at an upcoming industry meeting or trade show (our web site lists these events). Of course our sales staff will be happy to talk to you about the latest features in CHEMCAD, but come by and spend some time with our customer support engineers and our development staff . 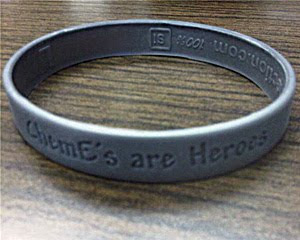 . . and we’ll have a free “ChemE’s are Heroes” wristband waiting for you. This blog entry is being written on a plane, somewhere between Mumbai/Bombay and Newark. Did you know that CHEMCAD is a global program? At last count, the software is being used in more than 70 countries around the world. I frequently visit our distributors, to help ensure that they can give the same level of support to their customers that we demand from our own employees. While presenting some case studies of CHEMCAD use, I recently showed a roomful of engineers a hidden feature of CHEMCAD which is very useful. We sometimes hear, “Learning this feature alone was almost worth the cost of training!” So, I decided to share this trick—and a few others that I like—with our blog readers. Engineering units are a constant frustration when you work across international borders. The default engineering units of CHEMCAD are English units, because the program was written by engineers in the USA. You probably know that the Format > Engineering Units command enables you to select different units (you can even specify local gauge pressure and reference temperature for standard vapor volume flow rate). But did you know that CHEMCAD has a handy units converter? To use this fe ature, open any Edit Streams dialog and click the mouse in the temperature field. Now press the [F6] key on your keyboard. The Temperature units converter will appear, as shown at left. Type a number and then press [ENTER] to convert it. Better yet, click OK to send the converted value back to the flowsheet! Look at the Palette pane on the right side of the CHEMCAD screen. See the capital T symbol near the top? You can use this tool to add a text box to the flowsheet. I like to use this for simulation notes, but you can also dress up your text with the other drawing tools seen here—rectangles, lines, polygons—or even an imported graphics file. For text that will not be displayed on the flowsheet, just click the Notes tab at the bottom of the workspace and start typing. This is another convenient way to keep notes with the simulation. If you make a plot from the Plot menu, you can then use the Chart menu to export the plot’s data points to a table in MS Excel. Using a wheel mouse? Hold the wheel button down to click and drag the view of your flowsheet. You can also scroll the center wheel forward or back to zoom in or out, respectively. Find the section of the CHEMCAD toolbar that contains the various ‘zoom’ items. One of them is Zoom to fit. This resizes your view of the flowsheet to fit everything in the window.